➣ Toshihiko Sugiura, Daisuke Yajima, Kento Shoji, Yoshihiro Ohta, Tsutomu Yokozawa, ‘‘Control of Chain Ends of Polyesters in Polycondensation of AA and BB Monomers by Use of Solid-Phase Reagent’’, J. Polym. Sci., Part A: Polym. Chem., in press. ➣ 太田佳宏, 横澤　勉, “制御されたハイパーブランチポリアミドマクロ開始剤によるリニア-ハイパーブランチブロック共重合体の合成”, 高分子論文集, in press. ➣ Akihiro Yokoyama, Suguru Nakano, Tomoaki Saiki, Tsutomu Yokozawa:, "Poly(p-benzamide) Having Isopropyl-Substituted Chiral Tri(ethylene glycol) Side Chain: Synthesis and Helical Conformation”, J. Polym. Sci., Part A: Polym. Chem., in press. ➣ Yi-Lung Yang, Yi-Huan Lee, Yu-Ping Lee, Chi-Ju Chiang, Fong-Yu Hsu, Wei-Chun Hsu, Man-kit Leung, Leeyih Wang, Chi-An Dai, Yoshihiro Ohta, and Tsutomu Yokozawa, "Band Gap Tuning of Narrow-Dispersity Two-Dimensional Conductive Polymers with Electroactive Side-Chains”, J. Polym. Sci., Part A: Polym. Chem., 52 (9) 1217-1227 (2014). ➣ Yi-Huan Lee, Wei-Chih Chen, Yi-Lung Yang, Chi-Ju Chiang, Tsutomu Yokozawa, and Chi-An Dai, "Co-Crystallization Phase Transformations in All-Conjugated Block Copolymers with Different Main-Chain Moieties”, Nanoscale, 6 (10) 5208-5216 (2014). ➣ Yoshihiro Ohta, Tetsurou Niiyama, Akihiro Yokoyama, and Tsutomu Yokozawa, "Chain-Growth Condensation Polymerization Approach to Synthesis of Well-Defined Polybenzoxazole: Importance of Higher Reactivity of 3-Amino-4-Hydroxybenzoic Acid Ester Compared to 4-Amino-3-Hydroxybenzoic Acid Ester”, J. Polym. Sci., Part A: Polym. Chem., 52 (12) 1730-1736 (2014). ➣ Akihiro Yokoyama, Natsumi Kawano, Yuka Wada, Michihiro Nishikawa, Kazuto Takaishi, and Tsutomu Yokozawa, "Crystal Structure of N-isopropylanthranilic Acid Trimer; X-ray Structure Analysis Online, 30 (7) 35-36 (2014). <TY> Masataka Nojima, Yoshihiro Ohta, and Tsutomu Yokozawa: Investigation of Catalyst-Transfer Condensation Polymerization for Synthesis of Poly(p-phenylenevinylene)”, J. Polym. Sci., Part A: Polym. Chem., 52 (18) 2643-2653 (2014). ➣ Yi-Huan Lee, Yu-Ping Lee, Fan-Kai Wei, Chia-Hung Wu, Wei-Chih Chen, Ching Shen, Huai-An Jeng, Leeyih Wang, Ming-Wei Liu, Yi-Fan Chen, Tsutomu Yokozawa, and Chi-An Dai, "A New Strategy for Co-Assembling p-Conjugated Polymer/Cadmium Sulfide Hybrids into Efficient Charge-Transporting Nanochannel Array by Using All-Conjugated Diblock Copolymer Motif”, J. Mater. Chem. A, 2 (35) 14600-14612 (2014). ➣ Yi-Lung Yang, Yi-Huan Lee, Yu-Ping Lee, Chi-Ju Chiang, Ching Shen, Chun-Ching Wu, Yoshihiro Ohta, Tsutomu Yokozawa, and Chi-An Dai, "Synthesis and Characterization of P3HT-P3HOT Random Copolymers with Tunable Band Gap via Grignard Metathesis Polymerization”, Polym. Int., 63 (12) 2068-2075 (2014). ➣ Masataka Nojima, Ryosuke Saito, Yoshihiro Ohta, Tsutomu Yokozawa, ‘‘Investigation of Mizoroki-Heck Coupling Polymerization as a Catalyst-Transfer Condensation Polymerization for Synthesis of Poly(p-phenylenevinylene)’’, J. Polym. Sci., Part A: Polym. Chem., 53 (4) 543-551 (2015). 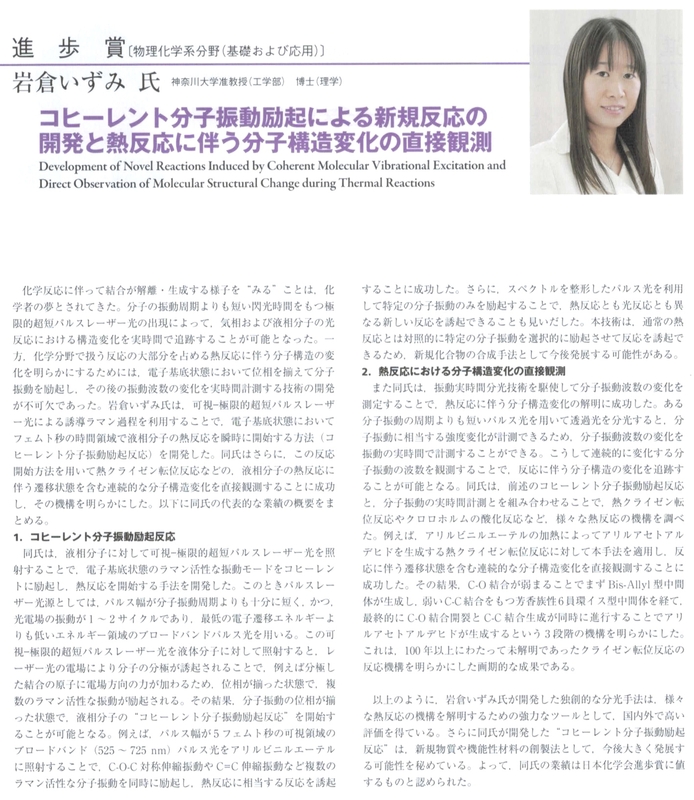 ➣ Kentaro Kosaka, Yoshihiro Ohta, Tsutomu Yokozawa, ‘‘Influence of the Boron Moiety and Water on Suzuki-Miyaura Catalyst-Transfer Condensation Polymerization’’, Macromol. Rapid Commun., 36 (4) 373-377 (2015). ➣ Y. Ohta, M. Karasawa, T. Niiyama, A. Yokoyama, and T. Yokozawa, "Synthesis of Well-Defined, Soluble Poly(3-alkyl-4-benzamide) by Chain-Growth Condensation Polymerization", J. Polym. Sci., Part A: Polym. Chem., 2014, 52, 360-365. ➣ Haibo Wenb, Ziyi Ge, Ying Liu, Tsutomu Yokozawa, Liang Lu, Xinhua Ouyang, and Ze Tan, "Efficient Synthesis of Well-Defined Polycarbazoles via Catalyst-Transfer Kumada Coupling Polymerization", Euro. Polym. J., 2013, 49, 3740-3743. ➣ Y. Ohta, T. Kanou, A. Yokoyama, and T. Yokozawa,, "Synthesis of Well-Defined, Amphiphilic Poly(ethylene glycol)-b-Hyperbranched Polyamide", J. Polym. Sci., Part A: Polym. Chem., 2013, 51, 3762-3766. Chem. Lett., 2013, 42, 641-642. ➣ R. Sugi, D. Tate, and T. Yokozawa, "Synthesis of Well-Defined Aromatic Polyamide-graft-Poly(tetrahydrofuran) by Chain-Growth Condensation Polymerization of Macromonomer", J. Polym. Sci., Part A: Polym. Chem., 2013, 51, 2725-2729. 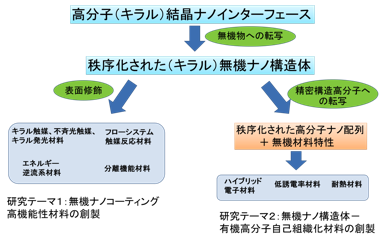 ➣ Y. Ohta, T. Shirakura, A. Yokoyama, and T. Yokozawa, "Synthesis of Polystyrene-graft-Poly(p-Benzamide) by Chain-Growth Condensation Polymerization and Radical Polymerization: Improvement of Thermal Properties of Polystyrene", J. Polym. Sci., Part A: Polym. Chem., 2013, 51, 1887-1892. ➣ Dong-Dong Yao, Ren-Hua Jin, “Synthesis of comb-like poly(ethyleneimine)s and their application in biomimetic silicification”, Polym. Chem., 6, 2255–2263 (2015). ➣ Xinling Liu, Yanfeng Gao, Hongjie Luo, Ren-Hua Jin, “Synergistically constructed polyamine/nanosilica/graphene composites: preparation, features and removal of Hg2+ and dyes from contaminated water”, RSC Adv, 4, 9594-9601 (2014). ➣ Ren-Hua Jin, Dong-Dong Yao, Rumi Levi, "Biomimetic synthesis of shaped and chiral silica entities templated by organic objective materials", Chem. Eur. J., DOI: 10.1002/chem.201400387 (in press). ➣ Xinling Liu, Yanfeng Gao, Ren-Hua Jin, Hongjie Luo, Peng Peng, Yu Liu, "Scalable synthesis of Si nanostructures by low-temperature magnesiothermic reduction of silica for application in lithium ion batteries", Nano Energy, 2014, 4, 31-38. ➣ Hiroyuki Matsukizono, HIroki Murata, Ren-Hua Jin, "Nanosheets-Stacked Chiral Silica Transcribed from Metal ions- and pH-tuned Supramolecular Crystalline Complexes of Polyamine/D-glucarate", Chem. Eur. J., 2014, 20, 1134 – 1145. ➣ Jian-Jun Yuan, Pei-Xin Zhu, Daisuke Noda, Ren-Hua Jin, "Controlled synthesis of ultrathin silica nanotube via spontaneous polycondensation on polyamine fibrils and its transformable property", Beilstein J. Nanotechnol. 2013, 4, 793–804. ➣ X.-L. Liu, P.-X. Zhu, Y.-F. Gao and R.-H. Jin, "Synthesis of free-standing sub-10 nm Y2O3:Eu particles on silica nanowire matrix and amplified luminescence performance", J. Mater. Chem. C, 2013, 1, 477-483. ➣ J.-J. Yuan, N. Kimitsuka, and R.-H. Jin, "Bioinspired Synthesis of a Soft-Nanofilament-Based Coating Consisting of Polysilsesquioxanes/Polyamine and Its Divergent Surface Control", ACS Appl. Mater. Interfaces 2013, 5, 3126−3133. ➣ Takayuki Ikehara, Daiki Ito and Toshiyuki Kataoka, “Analysis of the degree of crystallinity in interpenetrating spherulites of poly(ethylene succinate) and poly(ethylene oxide) blends using pulsed NMR”, Polym. J., released online. ➣ Toshiyuki Kataoka, Kohji Hiramoto, Hideo Kurihara and Takayuki Ikehara, “Effects of melt annealing on the miscibility and crystallization of poly(butylene succinate) and poly(ethylene succinate)”, Polym. J. 46, 405-411 (2014). ➣ S. Yamamoto, S. Nakahama, and K. Yamaguchi, "A Heterobifunctional Linker Bearing Azide-reactive Alkyne and Thiol-reactive Maleimide Connected with N-(2-Nitrobenzyl)imide to Synthesize Photocleavable Diblock Copolymers”, Chem. Lett. 2013, 42, 791­793. ➣ S. Nakagawa, T. Tanaka, T. Ishizone, S. Nojima, Y. Kakiuchi, K. Yamaguchi, and S. Nakahama, "Crystallization Behavior of Poly(ε-caprolactone) Chains Confined in Nanocylinders: Effects of Block Chains Tethered to Nanocylinder Interfaces”, Macromolecules 2013, 46, 2199−2205. ➣ S. Kaneko, K. Yamaguchi, and J. Nakanishi, "Dynamic Substrate Based on Photocleavable Poly(ethylene glycol): Zeta Potential Determines the Capability of Geometrical Cell Confinement”, Langmuir 2013, 29, 7300−7308. ➣ Sugiyama, Y.; Heigozono, S.; Okamoto, S., "Iron-Catalyzed Reductive Magnesiation of Oxetanes to Gen-erate (3-Oxidopropyl)magnesium Reagents”, Organic Letters, 2014, 16, 6278-6281. ➣ Ibe, K.; Hasegawa, Y.; Shibuno, M.; Shishido, T.; Sakai, Y.; Kosaki, Y.; Susa, K.; Okamoto, S., "Simple and practical method for selective acylation of primary hydroxy group catalyzed by N-methyl-2-phenylimidazole (Ph-NMI) or 2-phenylimidazo[2,1-b]benzothiazoles (Ph-IBT)”, Tetrahedron Lett., 2014, 55, 7039-7042. ➣ R. Moriai, Y. Naito, R. Nomura, S. Funyu, K. Ishitsuka, N. Asano, S. Okamoto, "Design and synthesis of 2-(1,3-dialkoxy-2-methylpropan-2-yl)-1,3-diarylpropanes as tethering units for folded H-stacking polymers”, Tetrahedron Lett. 2014, 55, 2649-2653. ➣ S. Okamoto, Y. Sakai, S. Watanabe, S. Nishi, A. Yoneyama, H. Katsumata, Y. Kosaki, R. Sato, M. Shiratori, M. Shibuno, T. Shibuno, "Structure–activity relationship of dihydroimidazo-, dihydropyrimido, tetrahydrodiazepino-[2,1-b]-thiazoles and -benzothiazoles as an acylation catalyst", Tetrahedron Lett. 2014, 55, 1909-1912. ➣N. Takekoshi, K. Miyashita, N. Shoji, and S. Okamoto, "Generation of A Low-Valent Titanium from Titanatrane and Its Catalytic Reactions: Radical Ring Opening of Oxetanes”, Adv. Synth. Catal. 2013, 355, 2151-2157. ➣ R. Nomura, R. Moriai, M. Kudo, T. Hoshino, J. Watanabe, S. Funyu, K. Ishitsuka, and S. Okamoto, "Synthesis and Properties of Through-Space Conjugated Polymers Based on π―π Stacked 1,3-Biarylpropane Tethering Units”, J. Polymer Science Part A: Polymer Chemistry, 2013, 51, 3412-3419. ➣ T. Sakurada, Y. Sugiyama, S. Okamoto, "Cobalt-Catalyzed Cross Addition of Silylacetylenes to Internal Alkynes”, J. Org. Chem., 2013, 78, 3583-3591. ➣ R. Nomura, Y. Tsuchiya, H. Ishikawa, S. Okamoto, "Grignard allylic substitution reaction catalyzed by 1,2,3-triazol-5-ylidene magnesium complexes”, Tetrahedron Letters, 2013, 54, 1360-1363. ➣ Kazuko Nakazono, Tomonori Ishino, Tomoyuki Takashima, Daisaku Saeki, Daisuke Natsui, Nobuhiro Kihara, Toshikazu Takata, "Directed one-pot syntheses of crown ether wheel-containing main chain-type polyrotaxanes with controlled rotaxanation ratios", Chem. Commun., 50 (97), 15341-15344 (2014). ➣ Junya Nishiyama, Yoshimasa Makita, Nobuhiro Kihara, "The Cyclopentyl Group, As a Small but Bulky Terminal Group, Allows Rapid and Efficient Active Transport”, Org. Lett., 17 (1), 138–141 (2015). ➣ 長島　健太郎、木原　伸浩, 酸化反応のみによる架橋−脱架橋とリサイクル系の構築, 高分子論文集, 70 (12), 704-711 (2013). ➣ N. Kutsumura, S. Toguchi, M. Iijima, O. Tanaka, I. Iwakura, and T. Saito, "DBU-Promoted regioselective HBr-elimination of vicinal dibromides: Effects of the adjacent oxygen and/or other heterofunctional groups”, Tetrahedron, 70, 8004-8009 (2014). ➣ I. Iwakura, H. Ebina, K. Komori-Orisaku, and Y. Koide, "A theoretical and experimental study on meridional–facial isomerization of tris(quinolin-8-olate)aluminum (Alq3)”, Dalton Transactions, 43, 12824-12827 (2014). Adv. Polym. Sci., 2013, 262, 191-238. 高分子, 62 (5) 236-238 (2013-5). <SO> 岡本専太郎, “高分子科学最近の進歩：有機金属触媒反応による重合反応”, 高分子, 2014, 63, 654-657. <TY> T. Yokozawa, “Chemistry of Conjugated Polymers and Catalyst-Transfer Polymerization Part 1”, Organic Electronics Summer School, May, 2013 (Biaritz). <TY> T. Yokozawa, “Chemistry of Conjugated Polymers and Catalyst-Transfer Polymerization Part 2”, Organic Electronics Summer School, May, 2013 (Biaritz). <TY> T. Yokozawa, “Controlled Synthesis of π-Conjugated Polymers in Catalyst-Transfer Condensation Polymerization”, 11th International Symposium on Functional π-Electron Systems, June, 2013 (Arcachon). <TY> 横澤　勉, ｢縮合系高分子の分子量制御：連鎖縮合重合の開発｣, 平成25年度　未踏科学サマー道場, 2013年9月(逗子). <TY> T. Yokozawa, “Development of Chain-Growth Condensation Polymerization Since Coming Back from Jeff's Group”, 246th ACS National Meeting & Exposition, September, 2013 (Indianapolis). <TY> T. Yokozawa, “Controlled Synthesis of π-Conjugated Polymers”, International Symposium on Ionic Polymerizaion 2013, September, 2013（淡路島). <TY> 横澤　勉, ｢縮合系高分子の分子量制御：芳香族ポリアミドからπ共役系高分子まで｣, 富士フィルム吉田南工場講演, 2013年10月(藤枝). 川上義輝、加部義夫、山口和夫、横澤勉、芹澤孝謙、長谷川稔, 「ポリヘドラルシルセスキオキサンの製造法」, 特許第5273941号, 特願2007-113698, 登録平成25年5月24日. <TY>　松田　潤, 太田佳宏, 横澤　勉, 「分子量および分子量分布の制御されたハイパーブランチポリアミドを含むグラフトポリマーの合成」, 第 62 回高分子学会年次大会, 2013, 62, 186 (京都). <TY>　櫻井健人, 太田佳宏, 横澤　勉, 「トリエチレングリコールエステル末端を有する分子量と分子量分布の制御された水溶性ハイパーブランチポリアミドの合成」, 第 62 回高分子学会年次大会, 2013, 62, 242 (京都, 2013-5). 野嶋雅貴, 太田佳宏, 横澤　勉, 「炭素-炭素二重結合と芳香環との共役モノマーにおける触媒移動型縮合重合性の検討」, 第 62 回高分子学会年次大会, 2013, 62, 273 (京都). <TY>　杉浦利彦, 矢島大輔, 高橋昌史, 太田佳宏, 横澤　勉, 「固相反応剤を用いる重縮合による末端官能基化ポリエステルの合成」, 第 62 回高分子学会年次大会, 2013, 62, 274 (京都). <TY>　穐山莉奈, 郭　紹, 岡田佑太, 七島　祐, 太田佳宏, 横澤　勉, 「触媒移動型縮合重合によるポリチアゾールの合成検討」, 第 62 回高分子学会年次大会, 2013, 62, 278 (京都). <TY>　佐野勇太, 太田佳宏, V. Maurizot, I. Huc, 横澤　勉, 「主鎖にキノリン骨格を持つらせんまたはジグザグ構造のポリアミドの合成」, 第 62 回高分子学会年次大会, 2013, 62, 279 (京都). <TY>　小坂研太郎, 太田佳宏, 横澤　勉, 「Ni 触媒を用いた鈴木-宮浦カップリング触媒移動型縮合重合」, 第 62 回高分子学会年次大会, 2013, 62, 281 (京都). <TY>　太田佳宏, 櫻井健人, 松田　潤, 横澤　勉, 「トリエチレングリコールエステルを持つ AB2 モノマーの連鎖縮合重合による分子量と分子量分布の制御された水溶性ハイパーブランチポリアミドの合成」, 第 62 回高分子討論会, 2013, 62, 2305 (金沢). <TY>　松田　潤, 太田佳宏, 横澤　勉, 「分子量および分子量分布の制御されたハイパーブランチポリアミドマクロモノマーのラジカル重合によるグラフトポリマーの合成」, 第 62 回高分子討論会, 2013, 62, 2326 (金沢). <TY>　野嶋雅貴, 太田佳宏, 横澤　勉, 「触媒移動型連鎖縮合重合によるポリスチルベンの合成」, 第62回高分子討論会, 2013, 62, 2360 (金沢). <TY>　小坂研太郎, 太田佳宏, 横澤　勉, 「Ni 触媒を用いた鈴木-宮浦カップリング触媒移動型重合によるポリ 3 へキシルチオフェンの合成検討」, 第 62 回高分子討論会, 2013, 62, 2363 (金沢). <TY>　佐野勇太, 太田佳宏, Victor Maurizot, Ivan Huc, 横澤　勉, 「キノリンポリアミドの合成とその二次構造の検討」, 第 62 回高分子討論会, 2013, 62, 2364 (金沢). <TY>　杉浦利彦, 太田　佳宏, 金　仁華, 横澤　勉, 「固相反応剤を用いた AA +BB 縮合重合によるポリエステルの片末端制御」, 第 62 回高分子討論会, 2013, 62, 2365 (金沢). <TY>　加藤　将, 太田佳宏, 横澤　勉, 「モデル反応によるドナー－アクセプター二芳香環モノマーの触媒移動型連鎖縮合重合の検討」, 第 62 回高分子討論会, 2013, 62, 2398 (金沢). <TY>　杉浦利彦, 太田佳宏, 横澤　勉, 「固相反応剤を用いる重縮合による末端官能基化ポリエステルの合成」, 平成 25 年度　未踏科学サマー道場, 2013, p-08 (逗子). <TY>　野嶋雅貴, 太田佳宏, 横澤　勉, 「炭素-炭素二重結合と芳香環との共役モノマーにおける触媒移動型縮合重合性の検討」, 平成 25 年度　未踏科学サマー道場, 2013, p-09 (逗子). 小坂研太郎, 太田佳宏, 横澤　勉, 「Ni 触媒を用いた鈴木-宮浦カップリング触媒移動型縮合重合」, 平成 25 年度　未踏科学サマー道場, 2013, p-10 (逗子). 野嶋雅貴, 太田佳宏, 横澤　勉, 「炭素-炭素二重結合と芳香環との共役モノマーの触媒移動型連鎖縮合重合におけるモデル反応の検討」, 日本化学会第 94 春季年会, 2014, 1C4-16 (名古屋). 加藤　将, 太田佳宏, 横澤　勉, 「ドナー・アクセプター二芳香環モノマーの触媒移動型重合におけるモデル反応の検討」, 日本化学会第 94 春季年会, 2014, 1C4-18 (名古屋). <TY>　井上拓斗, 太田佳宏, 荒井義明, 金　仁華, 横澤　勉, 「キラルシリカ表面からポリ(アルキルチオフェン) への不斉転写」, 日本化学会第 94 春季年会, 2014, 1C4-20 (名古屋). <TY>　Masataka Nojima, Yoshihiro Ohta, and Tsutomu Yokozawa, “Investigation of Catalyst-Transfer Condensation Polymerization of Aromatic Monomers Containing C-C double bond”, 11th International Symposium onFunctional π-Electron Systems, 2013, p 64 (Arcachon). <TY>　Kentarou Kosaka, Yoshihiro Ohta, and Tsutomu Yokozawa, “The Effect of Water on Suzuki-Miyaura Catalyst-Transfer Condensation Polymerization”, 11th International Symposium on Functional π-Electron Systems, 2013, p 135 (Arcachon). <TY>　Masataka. Nojima, Ryosuke Saito, Yoshihiro Ohta, and Tsutomu Yokozawa, “Investigation of Heck Coupling Polymerization for the Synthesis of Poly(phenylenevinylene) as a Catalyst-Transfer Chain-Growth Polymerization”, International Symposium on Ionic Polymerization 2013, 2013, 170 (淡路島). <TY>　Yoshihiro Ohta, Kento Sakurai, Jun Matsuda, and Tsutomu. Yokozawa, “Synthesis of Well-Defined Water-Soluble Hyperbranched Polyamides by Chain-Growth Condensation Polymerization of AB2 TEG Ester Monomer”, International Symposium on Ionic Polymerization 2013, 2013, 171 (淡路島). <TI> 伊藤大記，片岡利介，池原飛之，“poly(butylene succinate)-block-poly(ethylene oxide)の結晶化に低融点成分が与える影響”，第63回高分子討論会，高分子学会予稿集，63，(2)，5095-5096，2014年9月，長崎．発表番号 2Pe049. <TI> 稲木翔一，片岡利介，池原飛之，“結晶性/結晶性のpoly(ethylene succinate)とpoly(ethylene oxide)からなるブロックコポリマーの光切断及び球晶成長速度の解析”，第63回高分子討論会，高分子学会予稿集，63，(2)，5101-5102，2014年9月，長崎．発表番号 2Pf052. <SO> 清水めぐ・杉山雄樹・田村和大・松野千加士・岡本専太郎，” 鉄触媒によるアルキニルオキセタンの分子内カルボメタル化反応”, 日本化学会第95春季年会，3PC-133 (2015年3月26-29日，日本大学理工学部（千葉）(発表予定)). <SO> 森合亮太, 内藤佑輔, 舟生重昭, 石塚健一, 浅野直紀, 岡本専太郎，“折り畳み型π積層高分子の合成と物性“, 第62回高分子討論会, 1Pe091 (2013年9月11-13日、金沢大学). <SO> 杉山雄樹, 桜田哲哉, 岡本専太郎, “コバルト触媒シリルアセチレンの内部アルキンへの付加反応”, 第60回有機金属化学討論会, P1B-25 (2013年9月12-14日、学習院大学). <SO> 竹腰直人, 宮下賢司, 正路則明, 松野千加士, 岡本専太郎, “チタナトランからの低原子科チタン種の発生とその触媒反応”, 第60回有機金属化学討論会, P1A-05 (2013年9月12-14日、学習院大学). ■　Yuta Sano, Outstanding Poster Award, Polycondensation 2014.
since 2013-08-01 / Copyright 2013 Kanagawa University. All Rights Reserved.